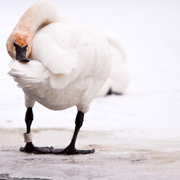 Did you know: Many of the Trumpeter Swans in Ontario are leg-banded with a metal band and identified with large plastic yellow wing-tags with a three-digit code on it. Tracking the health and movements of the swans is very important to the restoration program. We send all of the swan sightings that we collect to the Trumpeter Swan Restoration Program volunteers and they are entered into a database. This information is used in order to help estimate the population size, determine their range and keep track of patterns in migration. * Name is a required field. * Email is a required field. * Phone is a required field. * Date is a required field. * Total number of swans recorded is a required field.